The old-age forest section of Chapman State Park is a fascinating and regionally unique meeting ground for plants with a primary range in the inner Piedmont and mountains and those of the Coastal Plain. 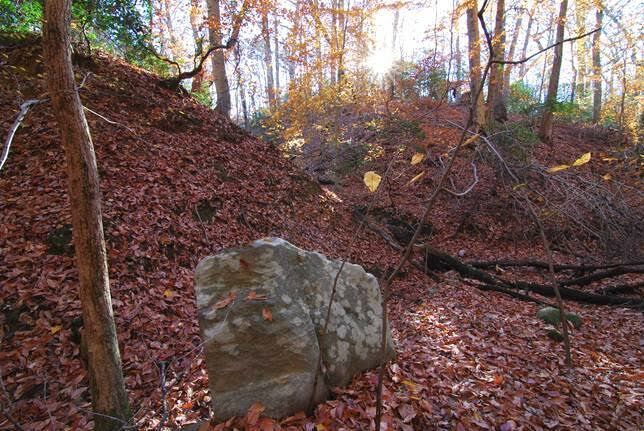 This section extends from the low river terrace and extensive Water-willow Shrublands along the Potomac River to the marl cliffs and ravines near Glymont, and it will be focus of this year’s Winter Solstice Walk. Each year the Potowmack Chapter of the VNPS is a co-sponsor of this event, led by VNPS member Rod Simmons. For those unable to attend the event, here is Rod’s description of some of the highlights. Most of the ravines and rolling valleys throughout the forested tract between Mount Aventine and Glymont comprise a globally rare natural community called Shell-Marl Ravine Forest, coined by Harvard botanist M.L. Fernald in the 1930s after discovering similar forest communities in the Virginia tidewater region to the south. 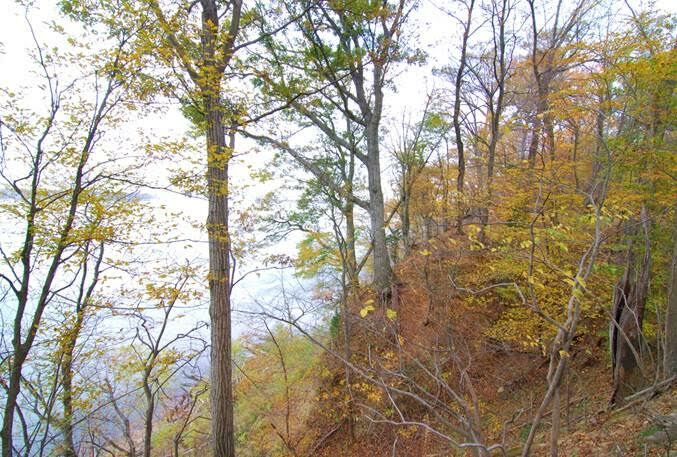 Steep rugged bluffs with Shumard Oak along the Potomac River at Chapman Forest. Photo by R.H. Simmons. This community type occurs only on the Coastal Plain where river bluffs and deep ravines over millennia have exposed underlying calcareous and glauconitic marine sands and marl beds deposited during the Paleocene, Eocene, and Miocene epochs when the area was a shallow sea at the western edge of the Atlantic Ocean. The Brightseat and Aquia Formations are the prominent underlying strata in this section of Chapman Forest. The combination of deep ravines, calcareous soils, and close proximity to the Potomac River has produced a remarkable flora predominately composed of species typical of the inner piedmont and carbonate areas of the Appalachians that are otherwise rare to absent on the Coastal Plain, especially in association. Chapman Forest is considered to be Maryland’s largest and finest example of this natural community type. Cherrybark Oak (Pagoda Oak) is a massive, long-lived tree of bottomlands and mesic forests of the southeastern U.S. that reaches the northernmost limits of its range in the Coastal Plain of Maryland and vicinity. This tree is not a component of Shell-Marl Ravine Forest, but is common and reaches great size at Chapman State Park on well-drained bottomlands and the coastal variant of Northern Coastal Plain / Piedmont Mesic Mixed Hardwood Forest that occurs above Shell-Marl Ravine Forest at the site. 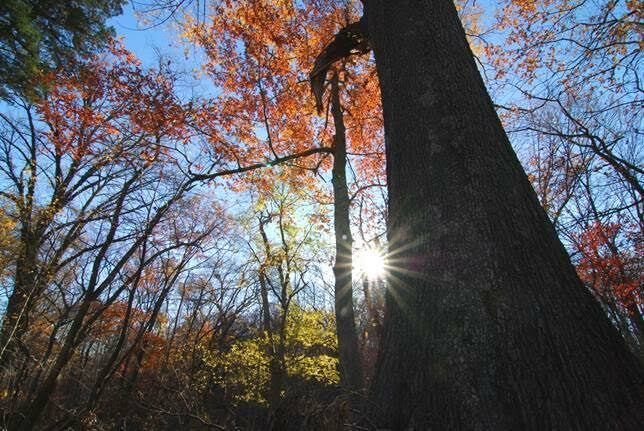 During this year’s trip, we’ll see a diversity of species and natural communities, including Maryland state champion Pagoda Oak (Quercus pagoda) and Chinquapin Oak (Quercus muehlenbergii). We’ll also see old-age Tulip Tree (Liriodendron tulipifera), White Ash (Fraxinus americana), American Beech (Fagus grandifolia), American Basswood (Tilia americana var. americana), Winter Grape (Vitis vulpina), Pignut Hickory (Carya glabra), Sweet Pignut Hickory (Carya ovalis), Sassafras (Sassafras albidum), Sweetgum (Liquidambar styraciflua), Sycamore (Platanus occidentalis), and other trees such as Dwarf Hackberry (Celtis tenuifolia), American Hop-hornbeam (Ostrya virginiana), Slippery Elm (Ulmus rubra), Red Mulberry (Morus rubra), Shumard Oak (Quercus shumardii), Deam’s Oak (Quercus x deamii), Paw Paw (Asimina triloba), and others. 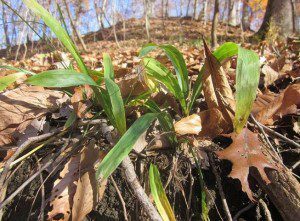 White Bear Sedge (Carex albursina), above, is yet another disjunct inhabitant of calcareous Shell-Marl Ravine Forest sections at Chapman State Park. Moreover, southern Maryland is the only known area of the Atlantic Coastal Plain for this plant. If there’s time, we also hope to take a moment to measure a champion-sized Deam’s Oak at this section of the forest. 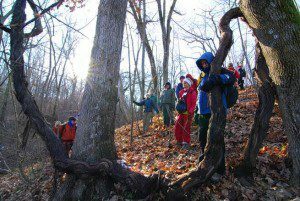 Here we have the December 15, 2013 Winter Solstice field trip participants also at Chapman Forest, experiencing first hand the impressive size of an ancient Winter Grape vine. CBH is the Circumference at Breast Height. 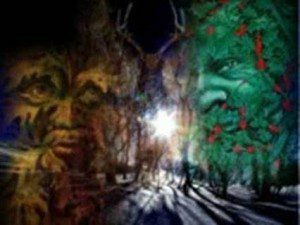 The Winter Solstice Walk is a special event, open to all, and celebrated in the spirit of the Green Man. If you are interested in attending this year, directions are here: Winter Solstice 2016.